For the past nine weeks, I have been creating content on my blog site for a Media and Communication University subject, BCM240, which explores the role that space, place and locality play in the understanding of media audiences. The act of learning played out quite differently to other subjects generally experienced in my time at University. There were no set readings and we weren’t spoon-fed information. Instead we were supplied with a topic, required to hunt for relevant sources that intrigued and attracted us, and then needed to write about our findings and our attitudes towards these in our weekly blog posts. Being the perfectionist that I am, the search for sources meant quite a lot of reading, but it was reading that I was interested and engaged in, so the time wasn’t really an issue and I feel as though I now have a greater understanding of media audiences because of this. I’m going to be quite sentimental and suggest that what I have valued most about the subject is the rich conversation that arose from the research I conducted with my parents. To gain insights into historical cinema and television experiences and spaces, my mother, father and I sat together at the dining table with a bottle of red wine, long into the night, as they shared with me their precious nostalgic memories of their first experiences with cinema and television. It gave me an awakening insight into their childhood and reminded me that my parents actually lived their own lives before my brother and I were on the scene, a time which I know so little about. The results of these nostalgic moments were the posts ‘Memoirs of Early Television: Fried Rice Fridays and Cellophane Improvisation’ and ‘A ‘Flea Shed’ Cinematic Experience’, possibly two of my favourite posts for this very reason. My all-time favourite post, however, would have to be the one that generated significant online and offline conversation. It was my very first post for the subject, ‘iLoo? Guilty’, which explored the notion of media consumption in the most private of spaces, the bathroom. With 32 views, 5 likes, 10 poll participants and multiple favourites on Twitter, it was undoubtedly my most successful post for the subject so far in terms of readership. I attribute this mainly to the controversial and comical nature of its content. Due to its popularity I’m hoping to explore the subject further through my digital storytelling project over the coming weeks. My readership statistics could have benefited from regular promotion on Twitter, as my tweets were quite sparse over the course of the subject. I believe that promotion on my personal Facebook would have also lead to increased hits, but first I need to overcome the fear of university-outsiders reading my blog content before I commit to such sharing – which is something I need to work on. Although I did ‘like’ and leave feedback on the blog posts of other students, I could have commented more frequently and over a greater variety of posts, even on the work of those not in the BCM240 subject. Gardner (2012) suggests that effective and thoughtful commenting not only contributes to the conversation, but also leaves your ‘digital footprint’, whereby other readers and writers can find their way to your blog, creating traffic and ultimately increasing readership. Although the production of weekly blogs has been challenging, it has also been a rewarding experience and I feel as though I have created an aggregation of posts discussing media audience motivation, behaviour and experiences which I am quite proud of. Through historical and modern explorations of place, space and locality, I have gained a deeper insight into media audiences and the true power of new media technologies. Hacktivism involves the similar disobedience and protest of activism, simply relocated into the online environment where skilful hackers do what they do best with the aim of promoting free speech, supporting human rights and exposing corruption. Groups of hactivists are responsible for denial of service attacks online, information theft, data breaches, web site defacement, typosquatting, and other acts of ‘digital sabotage’ (Paganini 2013). Whether you love, hate, condone or support him, Julian Assange is the perfect example of the term. Wikileaks was designed to benefit society by exposing top-secret information using his followers’ and his own tenacious hacking skills. In a networked society where information is free and hacker curiosity and confidence is high, the hacktivist culture is thriving and over the recent decades we have seen an influx of groups such as Omega, AntiSec and Anonymous causing a fluster online. In the online environment, where can we draw the line between cyber crime, hacktivism and pure cyber nuisance? The argument of hacktivism and crime is a point of wide debate. Many argue that channels already exist for free speech, and that hacktivism simply causes damage in the online world, while others insist that it is purely a form of protest and should therefore be protected. If those in power do not have the security over their information to withstand a hacktivist attack, I say let the lesson be learnt for whatever is it they have to hide. In a networked online world, information is free and skilful curiosity should not be labelled as crime. It’s clear that mobile telephones are revolutionary in their role of technological convergence. They transport many traditionally physical elements into our very own palms like the clock, calendar, camera and the Weather Man. But it’s the more unique applications within these devices that intrigue me and the places and spaces in which they transport us to. I call them our distraction devices. Instagram distracts from a boring train ride, SnapChats from our seemingly never ending piles of assessments, and text messages from the people around us, like the guy set up out the front of Subway trying to steal all of our pennies for Surf Life Saving. These devices transport us from previously monotonous public situations, to our own private realms where and when we choose. But the question stands, is this distraction even a choice anymore? I just returned from a beautiful trip up the coast, to a camping ground called Pebbly Beach, just north of Coffs Harbour, NSW. When we arrived at the destination, I sign greeted us: ‘No Running Water’. I tried not to think about it but I knew what that meant – no toilet and no shower for five days. However, it didn’t phase me too much. Something much more shocking was to come. After the 20 kilometre dirt road and creek crossing we arrived Pebbly. It was absolutely stunning. 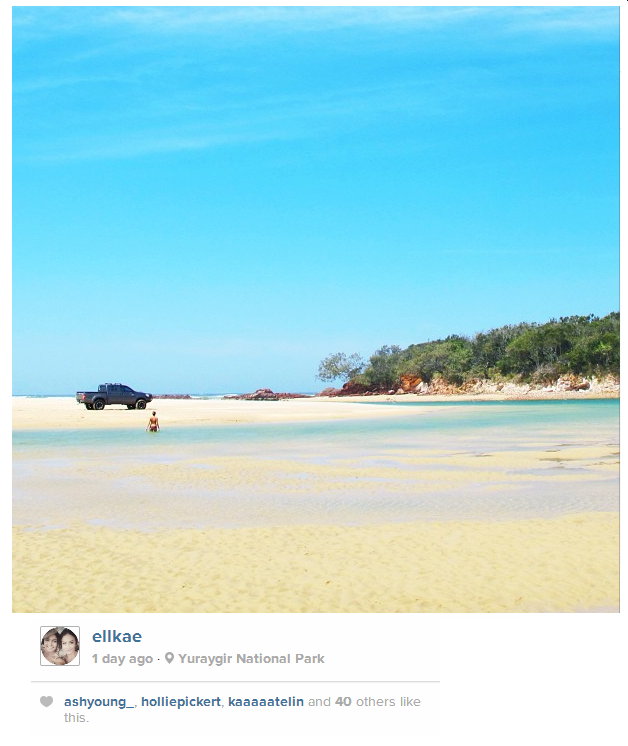 Much to my boyfriend’s disgust, I reached straight for my phone and snapped a photo on Instagram. Distracted. Then all of a sudden I noticed those hated tiny symbols at the top of my handset. I had no reception and no 3G coverage. No way of making the folks working back home jealous of my adventurous vacation up the coast. I was undeniably upset. I switched my phone of for the first four days of the trip and became somewhat empowered by the freedom of living in the moment with no distractions. On the fifth day, however, I cracked. I went for a run at 5am along the surrounding beaches, until I stumbled across some reception and my phone went into an acoustic frenzy. What followed was an overload of Instagram posts and a strange feeling of relief deep inside of me. Mobile phones are becoming an extended part of our beings, transporting us and ultimately distracting us. Facebook in lecture theatres, phone calls in restaurants, text messaging whilst driving, Instagram on remote beaches– this distraction is everywhere and the majority of it is no longer premeditated. Urban Screens: Wasted Space or a Step in the Right Direction? We are beginning to see the reverse effect of initial television: the private space is now relocating itself within the public arena. Since the mid-1990s, screens have emerged worldwide on unlikely urban surfaces and can now be found anywhere from taxis, gyms and restaurants, to doctor surgeries, festivals and shopping malls. They display anything from advertising and promotional material to television and film content. McGuire (2011) suggests that the very content that they display is often associated with their demise and that with the density of the displays, also comes their diminishing impact. At the University of Wollongong these urban screens are abundant. They sit balanced on walls and fittings surrounding the main thoroughfares on campus, the library entrance, popular cafes, eateries and common entry and exit points. But the question stands, is anyone truly watching? These screens have found their place in my eyes as visual pollution, of which my subconscious inevitably removes from processing. I have passed these screens on a daily basis for almost two years now and have never stopped to appreciate what they are trying to tell, or sell, me. I can assume that like most methods of public screening, they host advertising material or content unrelated to me. In my mind, they may as well be switched off. 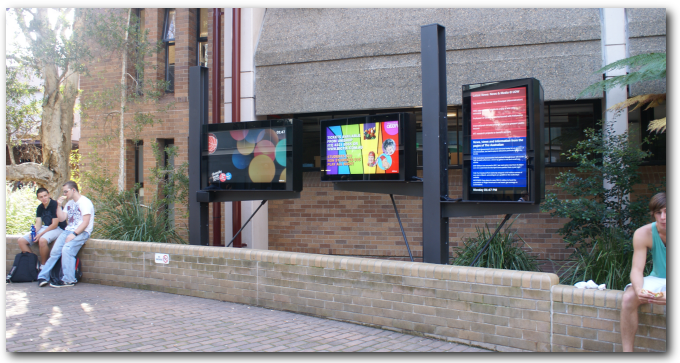 If these screens are to succeed in capturing the attention of distracted and time-scarce students and academics on campus, they need to evolve in order to take advantage of their infinite abilities instead of simply recreating traditional advertising billboards with the added effect of high definition movement. Interactivity is the key. With the roll out of the National Broadband Network, high speed internet connectivity is making this interactivity increasingly possible (McGuire 2011). Take a look at Coca-Cola’s use of their iconic digital billboard in Kings Cross during the recent ‘Share a Coke’ campaign, involving streetwalkers in new and exciting ways. RayBan uses interactive screens so that users can virtually try-on different sunglasses and Toyota’s ‘Vision Wall’ has taken touch screen technology to new levels. These interactive screens all have obvious hidden marketing agendas, but audiences seemingly don’t mind. Instead, they are actively contributing to the ‘buzz’ of the campaign by circulating and sharing content on social networking sites. These alternative spaces are also fostering new relationships, as they bring participating audiences together to interact. So I pose the question to University of Wollongong students and academics, what do you want to see on the screens located around campus? Personally, I would like to see an interactive map; I still get lost at the start of each session trying to find buildings I haven’t seen before and I can’t even begin to imagine how an overwhelmed one-off visitor would navigate around campus. If we manage to integrate audience interactivity into the screen content, no doubt the University will be moving one step in the right direction. McGuire, S 2011, ‘Networked Urban Screens and Participatory Public Spaces’, Telecommunications Journal of Australia, vol.61, no.4, pp64.1-66.10. The notion of the Long Tail was created by Wired editor Chris Anderson. The theory suggests that online content has reshaped traditional patterns of supply and demand and that our culture is shifting focus away from a large number of main stream products at the peak of the demand curve and towards a huge number of niche products that trail down the curve’s tail (Anderson n.d.). The shift of the retail sector to an online environment has greatly diminished the costs of overheads, production and distribution, making niche goods just as economically attractive. This means that there is now far less need to fit products and consumers into a ‘one-size-fits-all’ category (Anderson n.d.). Anderson (2004) suggests that the future of profit ‘is in the millions of niche markets at the shallow end of the bitstream’. Before the rise of internet fashion stores, one could crawl retail outlets of the local shopping malls for hours on end, often leaving with empty hands and feelings of dissatisfaction. However, recently there has been a surge in mega supply online retailers like The Iconic, ShopBop and Zappos offering consumers an abundance of fashion products, many of which they would have never stumbled upon by traditional means. When consumers are offered an almost infinite choice, Anderson (2004) suggests that the true shape of demand is revealed, the Long Tail. Tony Hsieh from Zappos has seen the same apply to fashion goods, with his company selling more than 3 million products across 1000 brands and finding that the top 20% of products account for half of their revue and the bottom 80% account for the other half . People are known to gravitate towards niches because they satisfy their unique interests better (Anderson n.d.) and let’s face it, fashion is as individual a choice as they come. It’s no surprise that online retail is booming, leaving the traditional and often mainstream retail sector trailing far behind. Established big brands now have peace of mind with the ability to experiment with niche products and markets online while we, the consumers, also reap the benefits. We are offered an almost infinite choice. Sure, we forego the ability to physically touch and feel the product, to try it on for fit, and to take it home with us there and then, but with free overnight shipping, 100 day refund policies and almost limitless choice, you surely won’t hear me complain. Anderson, C 2004, ‘The Long Tail’, Wired, October, viewed 15 September 2013. Anderson n.d., The Long Tail, in a nutshell, The Long Tail, weblog post, n.d., 15 September 2013. Fandom- the word takes me back to the year 1998 when I was a 10 year-old school girl at Jamberoo Primary. To say that I was a fan of the pop group, the Spice Girls, would be an understatement. I’d wake early every Saturday and Sunday morning just to tune in to Rage and Video Hits for a glimpse of their girl power on the TV, no doubt using a hair brush for a microphone as I sang along eloquently. My bedroom hosted countless pieces of memorabilia that I had managed to collect over the years with the help of the tooth fairy, pocket money and generous amounts of begging over the festive season. It started off with Spice Girl mini books, stamps and stickers and my collection soon evolved to comprise of all five dolls, handbags, stationary, backpacks and posters that lined every inch of my bedroom walls. It was safe to say that I was a fan – but I wasn’t the only one. The love for the pop group was rampant through our small school and my friends and I decided to take our mode of fandom a little further. We created our own Spice Girls group. As I was the athletic one, I was pronounced as ‘Sporty Spice’ and my best friend claimed the role of ‘Posh Spice’. The blondie of our group took the role of ‘Baby Spice’ and a freckly red-head girl, Shannon, from the grade above was invited to be ‘Ginger Spice’. To complete our quintet, we asked Alana to be ‘Scary Spice‘, as she was from the Seychelles and had dark skin. Stereotypical much? The five of us would meet for song and dance rehearsals in the majority of recess and lunch breaks (I needed it) and we would perform at weekly assemblies in front of the entire school, no doubt wowing them with our voices, enthusiastic dance moves and costumes. We were rather obsessed. Even as a child, I knew that the chance of meeting and engaging with my idols was almost impossible. I can vaguely recall us posting a handwritten letter to England for the Spice Girls, but I suppose we never really expected a reply. That didn’t happen back then. The closest you could dream of meeting your idols was to be the screaming girl in the front row at a concert, but at our ripe age, that was out of the question. I can liken my own infatuation with the Spice Girls to the current hype of school aged girls towards boy-band sensation, One Direction. Although, with the comparison of the two, hasn’t fandom seen a dramatic transformation with the rise of new technologies and participatory audiences? The role of the ‘fan’ has suddenly become a multi-dimensional one. Fans that were once simply consumers buying music and memorabilia are now engaged and actively producing their own fan content. Sullivan (2013) suggests that fans have now extended their interactions with their idols by logging onto online discussions and building communities with others who share the same passions. Some fans go even further as to modifying and appropriating characters, storylines and settings of their favourite media texts to suit their needs and interests (Sullivan, 2013). Conversing with idols is no longer a far off fantasy. Platforms like Twitter are making these interactions every bit possible within the online environment, meaning that fans have an increased chance of being noticed by their idols. This increased probability mixed with crazed teenage fans makes the likelihood of ‘fandom gone wrong’ higher than ever. That’s an issue that deserves a space of its own, so I’ll save that thought for next week. Stay tuned. Sullivan, J 2013, ‘Media Fandom and Audience Subcultures’, in Media Audiences: Effects, Users, Institutions, and Power, Sage Publications, London, pp. 189-212. Lessig is talking about the notion of copyright. We are living in a permission culture, ripe with copyright laws and litigation that protect creators from the unfair use of their intellectual property. In a networked society however, the term ‘intellectual property’ is one that is increasingly difficult to comprehend. It is safe to say that we are all guilty at some stage of copyright violation. Whether it be blatant illegal downloading of copyrighted films or an unattributed image posted on our Facebook page. With free flowing digital information, the rights of content creators are bound to be compromised. The internet functions on the free flow of information and according to Kevin Kelly (2008) it is a ‘copying machine’ with its foundations built on the very notion of copying information and passing it on. So in this new digital arena, should traditional copyright laws still stand? I find this topic quite difficult to form an opinion around. With an abundance of information is anything really ‘new’ anymore? All creators have sources of inspiration, people and works that spark interest and ideas. When their inspirations can be seen through these new works, where can the line drawn between fair use and the copying of intellectual property? On the other hand, it can be argued that without copyright, why would people create? Where is the incentive? If created works could be taken and claimed by someone else as their own, this incentive disappears so the notion of artificial scarcity on digital property seems warranted. As Boldrin and Levine (2008) suggest, ‘intellectual property laws need to strike a balance between providing sufficient incentive for creation and the freedom to make use of existing ideas’. What do you believe the future holds for networked environments? A permission or a free culture? Or is there a way that we can find strike a balance between the two? I’d love to hear your thoughts. Boldrin, M & Levine, D 2008, Against Intellectual Monopoly, Cambridge, New York. Kelly, K 2008, Better Than Free, The Technium, weblog post, viewed 1 September 2013. Lessig, L 2004, Free Culture, Penguin Books, New York.